Not to be confused with Santa Cruz County, Arizona. Images, from top down, left to right: The Santa Cruz Beach Boardwalk in 2005, a walkway through redwood groves in Big Basin Redwoods State Park, the Roaring Camp and Big Trees Narrow Gauge Railroad in 2008, Downtown Watsonville in 2010, Davenport Beach in 2006. Santa Cruz County, California, officially the County of Santa Cruz, is a county on the Pacific coast of the U.S. state of California. As of the 2010 census, the population was 262,382. The county seat is Santa Cruz. 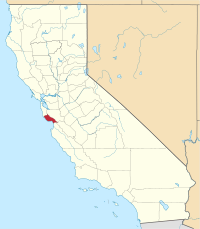 Santa Cruz County comprises the Santa Cruz–Watsonville, CA Metropolitan Statistical Area, which is also included in the San Jose–San Francisco–Oakland, CA Combined Statistical Area. The county is on the California Central Coast, south of the San Francisco Bay Area region. The county forms the northern coast of the Monterey Bay, with Monterey County forming the southern coast. Santa Cruz County was one of the original counties of California, created in 1850 at the time of statehood. In the original act, the county was given the name of "Branciforte" after the Spanish pueblo founded there in 1797. A major watercourse in the county, Branciforte Creek, still bears this name. Less than two months later on April 5, 1850, the name was changed to "Santa Cruz" ("Holy Cross"). Mission Santa Cruz, established in 1791 and completed in 1794, was destroyed by the 1857 Fort Tejon earthquake, but a smaller-scale replica was erected in 1931. According to the U.S. Census Bureau, the county has a total area of 607 square miles (1,570 km2), of which 445 square miles (1,150 km2) is land and 162 square miles (420 km2) (27%) is water. It is the second-smallest county in California by land area and third-smallest by total area. Of California's counties, only San Francisco is physically smaller. The county is situated on a wide coastline with over 29 miles (47 km) of beaches. It is a strip of about 10 miles (16 km) wide between the coast and the crest of the Santa Cruz Mountains at the northern end of the Monterey Bay. It can be divided roughly into four regions: the rugged "north coast"; the urban City of Santa Cruz, Soquel, Capitola, and Aptos; mountainous Bonny Doon, San Lorenzo River Valley; and the fertile "south county", including Watsonville and Corralitos. Agriculture is concentrated in the coastal lowlands of the county's northern and southern ends. Most of the coastline is flanked by cliffs. Año Nuevo State Marine Conservation Area, Greyhound Rock State Marine Conservation Area and Natural Bridges State Marine Reserve are marine protected areas off the coast of Santa Cruz County. Like underwater parks, these marine protected areas help conserve ocean wildlife and marine ecosystems. The county of Santa Cruz has experienced demographic fluctuations in recent history. Between 1990 and 2000, population increased 11.3%. This is primarily not because of immigration or migration, but because of new births. In 1980, Santa Cruz county was 21% Latino, which rose to 28% in 1990 and 39% in 2000. The area between Watsonville in south Santa Cruz County and Salinas Valley of northern Monterey County is primarily Latino. The 2010 United States Census reported Santa Cruz County had a population of 262,382. The racial makeup of Santa Cruz County was 190,208 (72.5%) White, 2,766 (1.1%) African American, 2,253 (0.9%) Native American, 11,112 (4.2%) Asian, 349 (0.1%) Pacific Islander, 43,376 (16.5%) from other races, and 12,318 (4.7%) from two or more races. Hispanic or Latino of any race were 84,092 persons (32.0%). As of the census of 2000, there were 255,602 people, 91,139 households, and 57,144 families residing in the county. The population density was 574 people per square mile (222/km2). There were 98,873 housing units at an average density of 222 per square mile (86/km2). There were 91,139 households out of which 31.9% had children under the age of 18 living with them, 48.0% were married couples living together, 10.2% had a female householder with no husband present, and 37.3% were non-families. 25.1% of all households were made up of individuals and 8.2% had someone living alone who was 65 years of age or older. The average household size was 2.71 and the average family size was 3.25. In the county, the population was spread out with 23.8% under the age of 18, 11.9% from 18 to 24, 30.8% from 25 to 44, 23.5% from 45 to 64, and 10.0% who were 65 years of age or older. The median age was 35 years. For every 100 females there were 99.7 males. For every 100 females age 18 and over, there were 97.8 males. The median income for a household in the county was $53,998, and the median income for a family was $61,941. Males had a median income of $46,291 versus $33,514 for females. The per capita income for the county was $26,396. About 6.7% of families and 11.9% of the population were below the poverty line, including 12.50% of those under age 18 and 6.30% of those age 65 or over. Santa Cruz county residents tend to be well-educated. 38.3% of residents age 25 and older hold a bachelor's degree at least, significantly higher than the national average of 27.2% and the state average of 29.5%. Santa Cruz County was a Republican stronghold for most of the 19th and 20th centuries; from 1860 through 1980 the only Democrats to carry Santa Cruz were Woodrow Wilson in 1916, Franklin D. Roosevelt in 1932 and 1936, Lyndon B. Johnson in 1964, and Jimmy Carter in 1976. However, the opening of UCSC in 1965 caused the county’s political landscape to dramatically change. Today, it is a strongly Democratic county in presidential and congressional elections. The last Republican to carry the county was Ronald Reagan in 1980, and the last Republican to win a majority in the county was Richard Nixon in 1968. The last Republican to represent a significant portion of Santa Cruz in Congress was Burt L. Talcott, who was defeated in 1976 by Leon Panetta. Santa Cruz County is split between California's 18th and 20th congressional districts, represented by Anna Eshoo (D–Atherton) and Jimmy Panetta (D–Carmel Valley), respectively. In the State Assembly, Santa Cruz County is split between the 29th and 30th Assembly districts, represented by Democrat Mark Stone and Democrat Robert Rivas, respectively. In the State Senate, Santa Cruz County is entirely in the 17th Senate District, represented by Democrat Bill Monning. In the 19th century, Santa Cruz's economy was based on milling lumber, making lime cement from limestone, and tanning leather. By the mid 19th century, Santa Cruz was the second largest manufacturing area in the state. As natural resources depleted, tourism became the more important economic sector in the area. In 1989, Santa Cruz was named as a surplus labor area by the U.S. Department of Labor. A surplus labor area has an unemployment rate 20% higher than national unemployment. As of 2018, Santa Cruz City and Watsonville city are still on this list. 10% of jobs in Santa Cruz County are food producing/processing jobs. These employees make less than an average of $10 a hour. As of 2003, 21% of residents work outside of Santa Cruz County. This is down form the 28% outside employment rate of 1989. The agriculture businesses are significant enough to be prominent in local politics, where they influence issues of water, pesticide use, and labor. There are mandated living wages for Santa Cruz county, and individually in the cities of Watsonville and Santa Cruz. These occurred after The Santa Cruz Living Wage Coalition campaigned to set up ordinances. The low wage sector of Santa Cruz experiences workplace abuse. Data from 2015 show that in the county, 38% of Agricultural workers have experienced overtime pay violation, 14% of tipped workers reported tips stolen by their employers, and 50% of service sector workers reported violations on receiving breaks. It is California law for employers to make written workplace policies available. However, in a county wide survey, 30% of workers reported that they did not receive an employee handbook. In 2002, the National Association of Realtors reported that Santa Cruz was the most unaffordable place to live in the United States. This statement remains true with 2017 data that shows that Santa Cruz is the least affordable county for renters. In Santa Cruz County, 60% of residents rent and a median monthly rent is $3000. UCSC's No Place Like Home Project reports that in Santa Cruz County, 2.5 minimum wage jobs would be needed to afford renting a 2 bedroom apartment. UCSC's "No Place Like Home" project identifies four main rental markets: agricultural workers, UCSC students, Silicon Valley tech workers, and short term vacation rentals. Short term rentals in particular have been a rising concern to local politicians, who have proposed parking restrictions to discourage short term renters. Rent control has been attempted as a policy in Santa Cruz three times between the 1970s and 1980s, but it never passed. National policies since the 1980s have deregulated rental markets, which decreased the rights of tenants and exacerbated frustrations for renters all across the country as well as in Santa Cruz. 27% of surveyed Santa Cruz County renters experience "overcrowding" in their homes, which is described as when there is more than one person per room of a house, which includes all rooms not just bedrooms. One of the constraints on Santa Cruz's development are environmental protections. The restrictions on land prevent development from responding to housing and employment demands, which is an issue particularly politically relevant in the Watsonville jurisdiction. This conflict between residents wanting to protect the environment and those wanting more housing is also racially divided, as most residents favoring environmental protection are white, while the population on the side of developing housing is more heavily Latino. A 2010-2011 report by a Santa Cruz County grand jury states that Watsonville had no policy for assessing environmental hazards, and would give out land use and building permits without any investigations of the environmental conditions of the land in question. One of the housing solutions that residents have resorted to is the occupation of accessory dwelling units. Commonly known as "mother-in-law" units, these secondary housing spaces on residential property used to be illegal to build. In 2002, Santa Cruz leaders changed the law and encouraged construction with affordable mortgages. The goal was to contain urban sprawl while still finding housing alternatives for residents in light of the crisis that was exacerbated by UCSC growth and Silicon Valley encroachment. Debates about land use in Santa Cruz were particularly important after the 1989 Loma Prieta Earthquake, which destroyed the central business district of Santa Cruz. This event led to the loss of an estimated 2,000 jobs. Already contentious debates about land were present in the area due to its large tourism industry and the relatively new UCSC campus, but after the quake both private interests and public servants had a stake in how rebuilding would go. This led to a necessary compromise, a public-private partnership that debated the how to rebuild the pacific garden mall space, with considerations of green space, timely implementation, and supporting local business and economy. Many constituents felt left out of this process, and reported that the political elite and economic elite were monopolizing control over the rebuilding movement. Winemaking—both the growing of the grapes and their vinting—is an important part of the economic and cultural life of Santa Cruz County. The wines of the David Bruce Winery and Ridge Vineyards were selected for tasting in the Paris Wine Tasting of 1976 (Tabor, p.167-169). Santa Cruz County is served by the Santa Cruz Metropolitan Transit District bus system. An Amtrak Thruway Motorcoach "Highway 17 Express" bus between Santa Cruz and San Jose is jointly operated by Amtrak, the SCMTD and the Santa Clara Valley Transportation Authority. Greyhound Lines bus service also serves Santa Cruz County. There is a notable private airport, Monterey Bay Academy Airport, which is a former military base. The nearest airports for scheduled commercial travel include San Jose International Airport, Monterey Regional Airport, San Francisco International Airport, and Oakland International Airport. The population ranking of the following table is based on the 2010 census of Santa Cruz County. ^ "Mount Bielewski". Peakbagger.com. Retrieved April 18, 2015. ^ "Central Coast". California State Parks. California Department of Recreation. Retrieved July 26, 2014. ^ "California: Consolidated Chronology of State and County Boundaries". The Newberry Library. 2003. Retrieved May 15, 2012. ^ "2010 Census Gazetteer Files". United States Census Bureau. August 22, 2012. Retrieved October 4, 2015. ^ "Fun Outdoor Things To Do In Santa Cruz". www.thingstodoinsantacruz.com. Retrieved March 14, 2018. ^ Libraries, Santa Cruz Public. "Endangered Species in Santa Cruz County - Santa Cruz Public Libraries". www.santacruzpl.org. Retrieved March 14, 2018. ^ "Species Profile California Clapper Rail". US Fish and Wildlife Service. Retrieved 2015-01-29. ^ "Species Profile California red-legged frog". US Fish and Wildlife Service. Retrieved 2015-01-29. ^ "Species Profile California tiger salamander". US Fish and Wildlife Service. Retrieved 2015-01-29. ^ "North-Central California Coast Recovery Program 5-Year Review: Summary and Evaluation of California Coastal Chinook Salmon ESU, Central California Coast Coho Salmon ESU" (PDF). National Oceanic and Atmospheric Administration. 2011. Retrieved December 3, 2013. ^ "Species Profile Marbled murrelet". US Fish and Wildlife Service. Retrieved 2015-01-29. ^ "Species Profile Mount Hermon June beetle". US Fish and Wildlife Service. Retrieved 2015-01-29. ^ "Species Profile Ohlone tiger beetle". US Fish and Wildlife Service. Retrieved 2015-01-29. ^ "Species Profile San Francisco garter snake". US Fish and Wildlife Service. Retrieved 2015-01-29. ^ "Species Profile Santa Cruz long-toed salamander". US Fish and Wildlife Service. Retrieved 2015-01-29. ^ "Species Profile Southern Sea Otter". US Fish and Wildlife Service. Retrieved 2015-01-29. ^ "North-Central California Coast Recovery Domain 5-Year Review: Summary and Evaluation of Central California Coastal Steelhead DPS Northern California Steelhead DPS" (PDF). National Oceanic and Atmospheric Administration. 2011. Retrieved December 3, 2013. ^ "Species Profile Yellow-billed cuckoo". US Fish and Wildlife Service. Retrieved 2015-01-30. ^ a b c d e f g h Manuel, Pastor Jr.; Benner, Chris; Rosner, Rachel (May 2003). "An "option for the poor": A research audit for community-based regionalism in California's central coast". Economic Development Quarterly, Thousand Oaks. 17 (2). ^ a b c d e f g h i U.S. Census Bureau. American Community Survey, 2011 American Community Survey 5-Year Estimates, Table B02001. American FactFinder Archived September 11, 2013, at the Wayback Machine. Retrieved October 26, 2013. ^ U.S. Census Bureau. American Community Survey, 2011 American Community Survey 5-Year Estimates, Table B03003. American FactFinder Archived September 11, 2013, at the Wayback Machine. Retrieved October 26, 2013. ^ U.S. Census Bureau. American Community Survey, 2011 American Community Survey 5-Year Estimates, Table B19301. American FactFinder Archived September 11, 2013, at the Wayback Machine. Retrieved October 21, 2013. ^ U.S. Census Bureau. American Community Survey, 2011 American Community Survey 5-Year Estimates, Table B19013. American FactFinder Archived September 11, 2013, at the Wayback Machine. Retrieved October 21, 2013. ^ U.S. Census Bureau. American Community Survey, 2011 American Community Survey 5-Year Estimates, Table B19113. American FactFinder Archived September 11, 2013, at the Wayback Machine. Retrieved October 21, 2013. ^ "U.S. Decennial Census". United States Census Bureau. Archived from the original on May 12, 2015. Retrieved October 4, 2015. ^ "Historical Census Browser". University of Virginia Library. Retrieved October 4, 2015. ^ Forstall, Richard L., ed. (March 27, 1995). "Population of Counties by Decennial Census: 1900 to 1990". United States Census Bureau. Retrieved October 4, 2015. ^ "Census 2000 PHC-T-4. Ranking Tables for Counties: 1990 and 2000" (PDF). United States Census Bureau. April 2, 2001. Retrieved October 4, 2015. ^ Leip, David. "Dave Leip's Atlas of U.S. Presidential Elections". uselectionatlas.org. Retrieved March 14, 2018. ^ "Santa Cruz County Election Results, November 2004 (pdf)" (PDF). Archived from the original (PDF) on May 2, 2006. Retrieved May 4, 2006. ^ "California's 18th Congressional District - Representatives & District Map". Civic Impulse, LLC. Retrieved March 13, 2013. ^ a b c d e f g h i j k l m n o p q California Secretary of State. February 10, 2013 – Report of Registration Archived July 27, 2013, at the Wayback Machine. Retrieved October 31, 2013. ^ a b c United States Department of Justice, Federal Bureau of Investigation. Crime in the United States, 2012, Table 8 (California). Retrieved November 14, 2013. ^ Pascale, Celine-Marie (1995). The Public Response to Homelessness. ProQuest Social Sciences. ^ "United States Department of Labor". United States Department of Labor. 2018. ^ McCay, S., Espinoza, R., & Mora, S. C. (2015). Working For Dignity: The Santa Cruz County Low-wage Worker Study (Rep.). ^ a b c "No Place Like Home". No Place Like Home UCSC. Archived from the original on May 1, 2018. ^ Gumz, Jodi (March 30, 2017). "Santa Cruz County supervisors want rules for hosted rentals". Santa Cruz Sentinel. ^ Santa Cruz Grand Jury Final Report 2010-2011. "City of Watsonville: Fastest Growing City Looking For Leadership and a Fire Truck" (PDF). ^ Bernstein, Fred A. (February 6, 2005). "In Santa Cruz, Affordable Housing Without the Sprawl". The New York Times. ^ "Auditor-Controller" (PDF). www.co.santa-cruz.ca.us. Retrieved March 14, 2018. ^ McCord, Shanna (June 14, 2011). "Bethany University will close: Private funding didn't materialize". Santa Cruz Sentinel. Archived from the original on June 16, 2011. Retrieved June 17, 2011. ^ "flyairmonterey.com". flyairmonterey.com. Retrieved March 14, 2018. ^ "Home". Specialized Aviation. Retrieved March 14, 2018. Wikimedia Commons has media related to Santa Cruz County, California. Wikisource has the text of an 1879 American Cyclopædia article about Santa Cruz County, California.